Carlos Marichal is a great illustrator who was born in Spain but settled in Puerto Rico, where his children also developed into artists. He was a set designer for theater and also designed the majority of the books and posters produced by the Puerto Rican Cultural Institute. 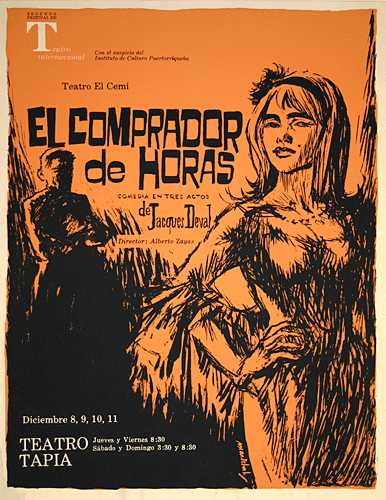 Marichal designed huge posters that promoted the theater festivals of Puerto Rico, the Tapia Theater, and the Universidad de Puerto RIco (UPR). His daughter Flavia is now the Museo de la UPR curator. Marichal was a man of grand qualities, a person who did not take no for an answer, and was highly loved and respected by all of those that were close to him. (deceased, Instituto de Cultura Puertorriqueño). Of the 316 posters in the collection, 7 are by Carlos Marichal.